Chances are that all of your students learned the concept of “more" when they were toddlers. Even my one-year-old granddaughter uses the sign for more when she wants another bottle or snack. So why is this an important math objective for students in kindergarten? There are so many concepts that are linked together when a child is developing number sense and this is one of them. Understanding the relationship between numbers and quantities all ties in together to assure success in math. 1. Students will identify whether the number of objects in one group is more than, less than, or equal to the number of objects in another group by using counting and matching strategies. 2. Students will compare two numbers between 1 and 10 presented as written numerals. 3. (Differentiation) Students will compare two numbers between 1 and 20 presented as written numerals. 4. Students will be able to describe the strategy they used to determine more or less. 1. Students should be able to count objects from 1-20 with one-to-one correspondence. 2. Students should be able to write numerals from 1-20. 1. To begin ask your students to wash their hands. For the activity children should work with a partner. Place a paper towel in front of each pair of students. Put six goldfish on the paper towel and designate it for one student and two goldfish for the other student. Tell them that no one should eat any of the snacks. You will, no doubt, hear grumbling that one of the pair has more than the other. Ask the students what they notice. One student has more and one student has less. Now ask the student with six goldfish to give his partner three of them. This time one student has five and the other is left with only three. Who has more and who has less? Ask students to talk together and decide what they can do to make the amount equal or the same. They will decide that each should have four goldfish. What strategy did they use to determine this? Did they need to count or could they look at the items and know without counting. Now they can eat! 2. Ask the students to sit in a circle on the floor. Pour twenty goldfish in a pile on a paper towel in the middle of the circle. Then pour nineteen goldfish on a paper towel next to the pile of twenty. Ask the students to decide which has more, which has less or do they have the same amount. What strategy can they use to find out? In this case counting will be necessary since it is a larger amount and the amounts are so similar. 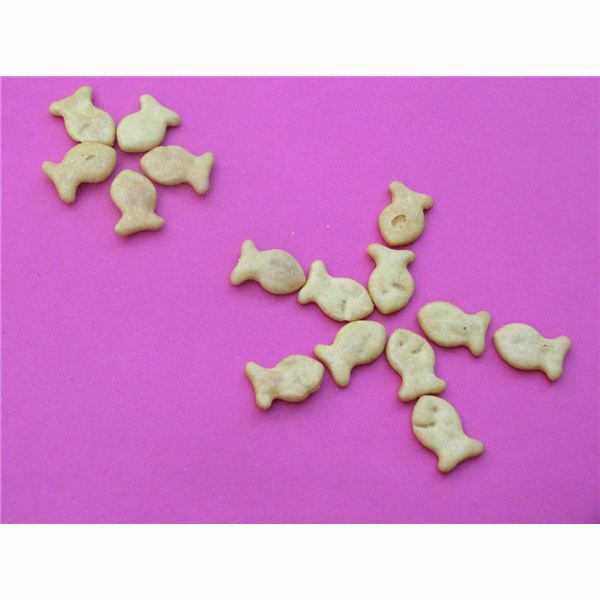 It is also possible that each pile of goldfish could be placed in a row and the students could see which line is longer or shorter. 3. Pairs of students should return to their seats with a cup of twenty two-color chips, paper and pencil. One student shakes the chips in the cup and pours them out. The partner writes how many of each color and circles the number that has more (or less, whichever one you choose). Then the partners trade places and do this again. Continue for about ten minutes and walk around to monitor the progress. 4. Say a number aloud. Students use the counters to show the number you have given. Then ask them to show two less or two more. Can they count the number they have now? Can they write the number? Read the book More or Less by Stuart J. Murphy. The main character, Eddie, guesses the ages of people in a carnival game. He does not make random guesses but rather he asks the right questions to narrow down the choices of what the answer could be. This is a problem solving skill that you want your students to practice. Even though this book eventually works with numbers higher than some of your students will know, the concept is the same. As you read, write the numbers on the board in a number line fashion that Eddie is working with. For example, he finds out that the girl is younger than ten and older than 7. So if you write the numbers 7, 8,9,10 the students will see that the girl is either nine or ten years old. Pass out number lines 1-10 to each student. Notice that when you move to the right (like when you are reading) the numbers are larger and indicate more. When you move to the left the numbers are smaller or mean less. As a challenge you may want to switch to the 1-20 number lines at some point. Now play a Mystery Number Game! To play, the student uses the index finger on each hand. The left index finger is placed on the number given in the beginning of the game and uses the index finger of the right hand to move up or down the number line. 1. Can you tell me the number that is two more than five? Left finger is on the number five. Right finger counts two numbers to the right. The answer is seven! 2. I am thinking of a number between 1 and 10. (The number is 8.) Let’s suppose someone guesses 4. The index finger goes on the number 4. Then I say it is more than 4. So they look to the right of the number 4 and see the choices they have. Now someone asks if it is the number 9. I tell them the number is less than 9. So now they have one finger on the four and one on the nine and can easily see the remaining choices. Who shot more baskets when you played basketball? Are their more chairs or fewer (less) chairs than the number of students in the room? How many more pencils do we need? Evaluate each student individually or in small groups using the number line and playing the Mystery Number Game. Murphy, Stuart. More or Less. Harper Collins, 2005. Hoban, Tana. More, Fewer,Less. Greenwilow, 1998. Arnold, Caroline. Who Has More? Who Has Fewer? Charlesbridge Publishing, 2004.